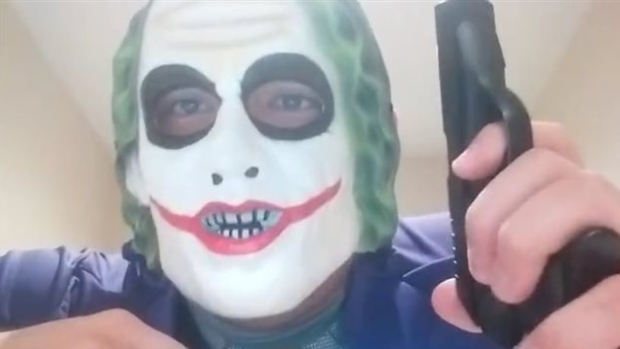 A Montreal man will spend the next few days in jail after being charged in connection with a YouTube video in which someone wearing a Joker mask says one Arab would be murdered in Quebec every week. Jesse Pelletier, 24, was arraigned on Wednesday on charges of uttering threats, possession of a false weapon, public incitement of hatred and hoax regarding terrorist activities. Pelletier, who was arrested early Wednesday morning, will remain behind bars until his bail hearing Monday. The person in the video was wearing a Joker mask and could be seen brandishing what looked like a pistol as he made the threats and spoke about last week’s terrorist attacks in Paris that left 129 people dead. “It’s really time to act,” the person said in the three-minute video.